From the page of Beer Magazine Issue #11! This is quick salad that really screams summer. It is perfect for those hot summer days when all you want to do is entertain outside with cold beer and a hot grill. The salad combines the best ingredients summer has to offer: grilled shrimp, ripe watermelon and basil. A bit of goat cheese, macadamia nuts and ginger complete the masterpiece. 1. Turn the grill to medium-high. 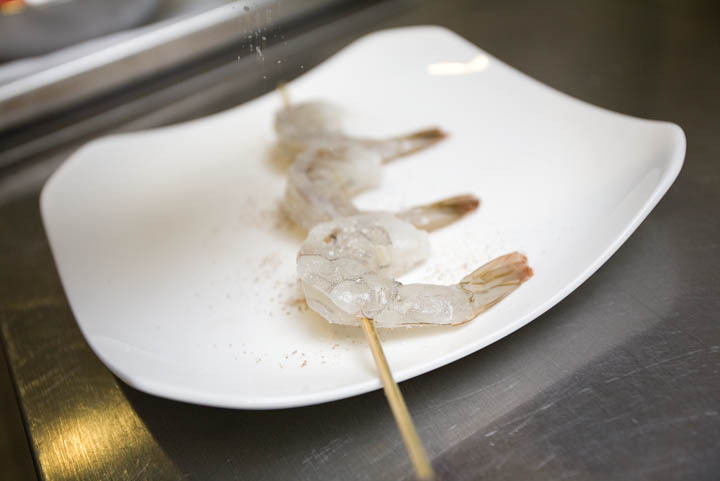 While it’s heating, place the shrimp on wooden skewers (this will help to cook them evenly and easily remove them from the grill; reserve until grill is ready). 2. 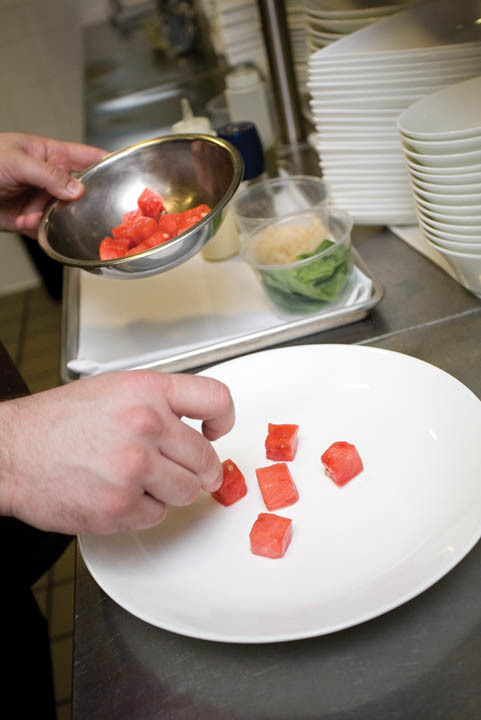 Cut the watermelon into various shapes, making sure to remove all rind including the white. You should be left with only the sweet red fruit. 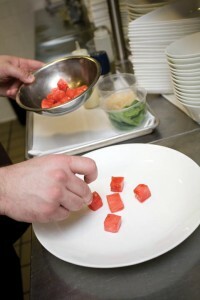 Place the melon in a bowl and sprinkle with lemon juice; reserve. 3. In a blender, place the egg yolks, soy, rice vinegar, ginger and water. Blend for 20 seconds or until smooth. 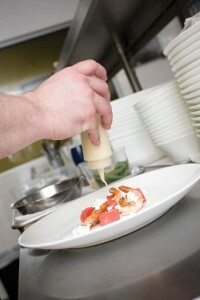 Then slowly begin adding the canola oil until a nice, thick emulsion has formed. Season the dressing with salt and sugar. Reserve. 4. 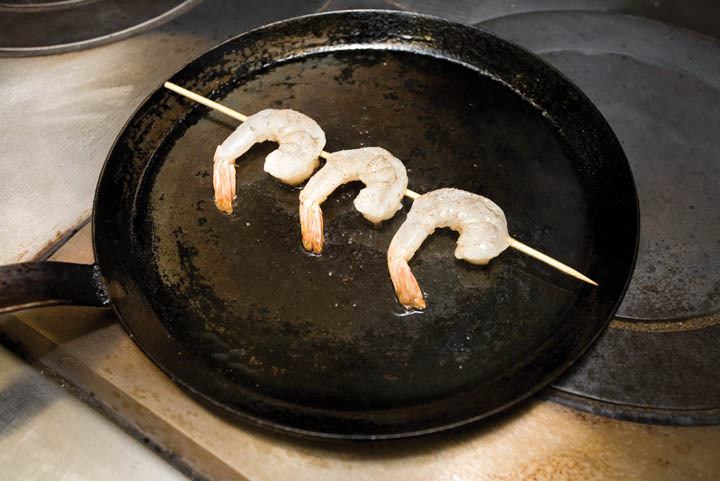 Season the shrimp with salt and pepper, then place on the grill. Let cook on each side for about 2 minutes. Once shrimp have just turned white, remove and place on tray to rest for 2 or 3 minutes. 5. 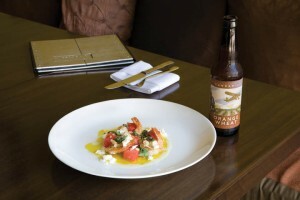 Arrange the watermelon on a plate, followed by the shrimp, goat cheese, ginger dressing, extra virgin olive oil, macadamia nut and basil. Finish with the sea salt and fresh cracked pepper. • If you can’t grill the shrimp, briefly sear them in a pan with a small amount of oil. 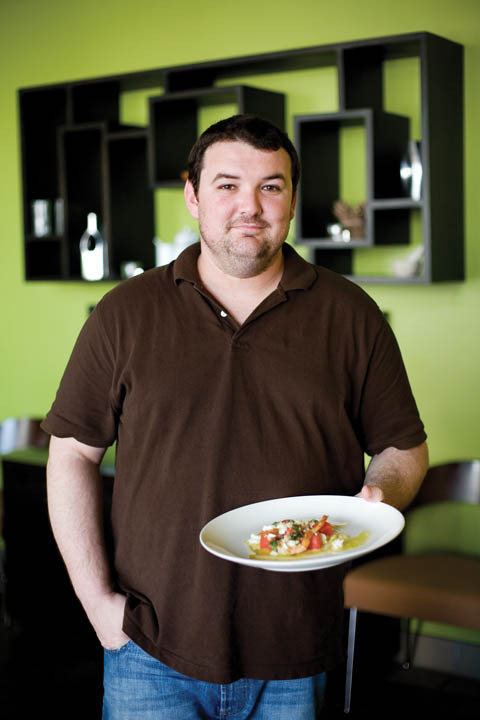 • Don’t like goat cheese? Leave it off. 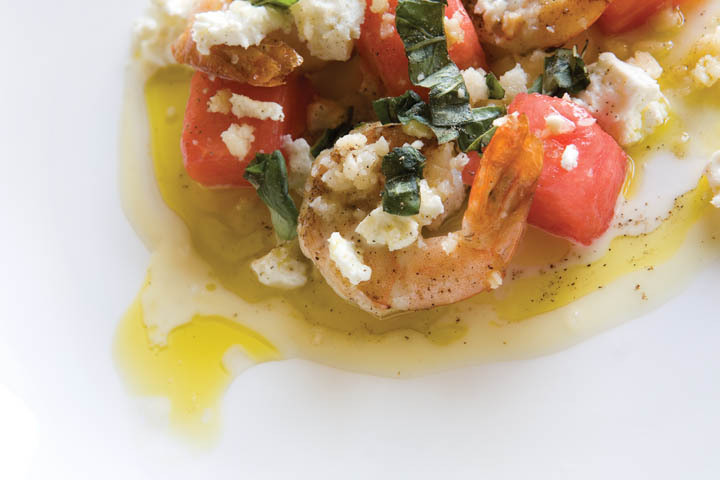 Whatever you do, don’t use just any cheese: shrimp must be delicately balanced with cheese and you would want to replace the goat cheese with a manchego, not blue. The key to this salad is balance. 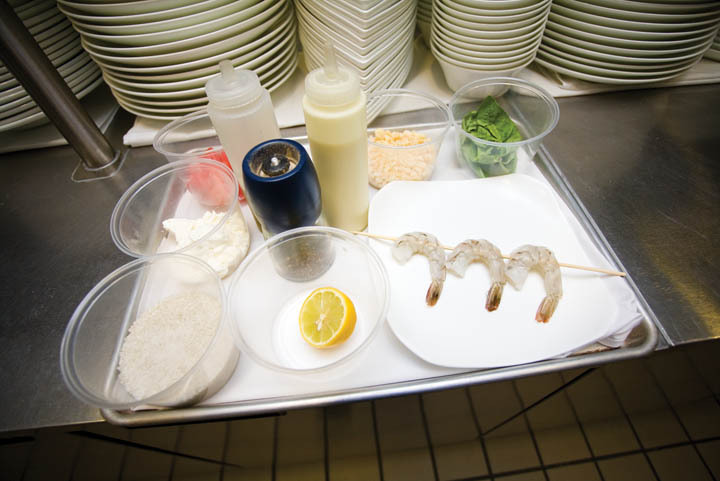 You are balancing the warm shrimp with the cool watermelon, the rice vinegar with the canola oil and the soft ingredients with the crunch of the macadamia nut. A good salad should satisfy all of your taste buds, from savory to sweet, crunchy to soft, salty to acidic. Most importantly, it should be refreshing. This salad accomplishes just that. 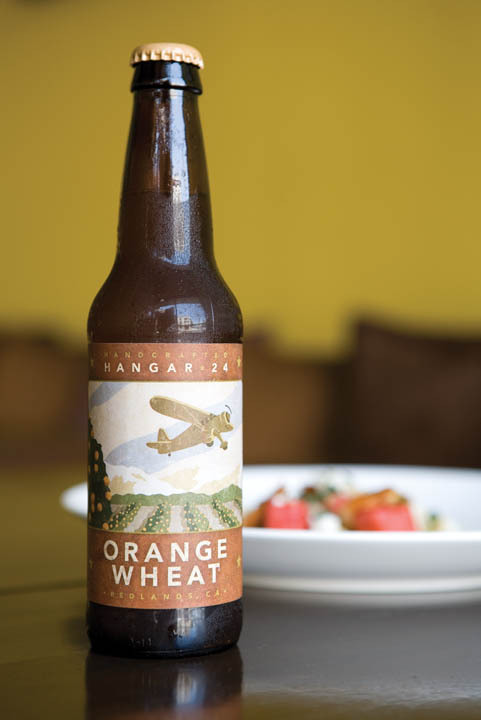 A good wheat beer is a perfect match.